How shall a man escape his ancestors, or draw off from his veins the black drop which he drew from his father’s or his mother’s life? It often appears in a family as if all the qualities of the progenitors were potted in several jars, –some ruling quality in each son or daughter of the house; and sometimes the unmixed temperament, the rank unmitigated elixir, the family vice is drawn off in a separate individual and the others are proportionally relieved. We sometimes see a change of expression in our companion and say his father or his mother comes to the windows of his eyes, and sometimes a remote relative. In different hours a man represents each of several of his ancestors, as if there were seven or eight of us rolled up in each man’s skin, –seven or eight ancestors at least; and they constitute the variety of notes for that new piece of music which his life is. . . . Men are what their mothers made them. It’s an interesting thought. On Halloween I posted a photo of my mother on Facebook, in memory of her death 15 years ago on that day. I was amazed at how many friends and family commented about how much I look like her. I am also amazed when the same comments are made about my daughter, Claire and me. I don’t see the resemblance as much as I feel it. I sometimes feel my mother in me with a turn of my head, or a sneeze that sounded like hers. I feel my mother in me when I cook, without recipes, feeling what to do next. I feel my father in me as I ponder spiritual things. I look at my large strong hands and see his. I stand by the mirror and see both of my parents in my body shape and size– we all have long skinny legs and short waists. It’s easy to see I am their daughter. It’s not as easy for me to see in myself the generations who came before my parents. Both of my mother’s parents pictured above, died before I was a few months old. But I suspect there are parts of me that resemble parts of them. I wonder if, when we someday meet our ancestors, we will be shown which parts, tendencies, thoughts or expressions have been passed down to us from whom. We are composite beings. We receive from many, and we pass along to a few. Emerson believed that it was difficult (if even possible) to break away from what you were handed genetically. At that point, my instinct challenges his thoughts. There are things we are because of who came before us, but we have agency to determine which traits we value and which we don’t. We have some say in what we choose to pass along to our children. I hope I will choose wisely and equip my own children with the best of all traits passed to me from those I love who came before. 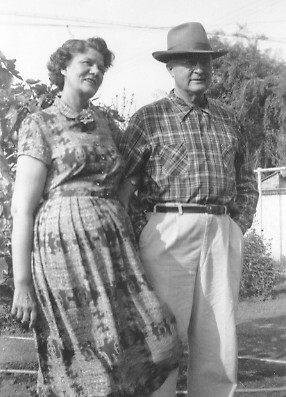 Pictured above are my grandparents, Ruby and Franklin Smuin.